In December 2013, Gala was very pleased to sign a major Contract with ILK Construction to supply a Gala Venue System for the 3,500-seats at the Baku Convention Centre. The planned design and Gala Venue System for 2,100 seats will make it possible for events such as: conferences, banquets, concerts, trade shows, corporate presentations and performances of very different type to take place in this venue within a 15-minutes change-over period. The auditorium can be used for electro acoustical performances and presentations. Nevertheless, the building has not been designed for classical Opera and not for classical theater. Gala is working in tight collaboration with ILK Construction, COOP Himmelblau Architects, Obermeyer Consultants and Ingenieurbüro Helmuth Tetzlaff to develop the beautiful and flexible auditorium. The custom designed seating will be supplied by Euroseating, headquartered in the Rioja region of Spain. The client, State Committee on Property Issues of the Republic for AZERBAIJAN, has imposed a scheduled opening in spring 2015, making it one of the fastest pace projects Gala has yet undertaken. Our design and production team has had to align all resources to move this project ahead efficiently to ensure an on-time delivery. As its capital city, Baku is known as the scientific, cultural and industrial center of Azerbaijan. In recent years, Baku has become an important venue for international events. It hosted the 57th Eurovision Song Contest in 2012 and will host the 2015 European Games. This international recognition and vision has sparked major building construction with inspired designs from leading architects worldwide. 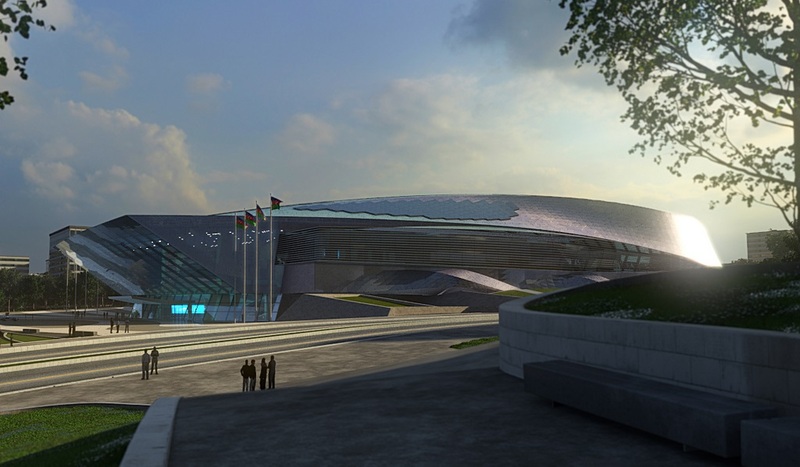 The multipurpose Convention Center will be a key component in Baku’s future commercial and touristic expansion. Gala is furnishing several stage lifts an orchestra lift and 42 rows of automated seating risers for this project. Apart from the tight delivery some of the major design challenges are to have air conditioning channeled from underneath the venue system flooring and regular access from the stage areas and throughout the venue system equipment. We are motivated to provide this quality venue the highest standard automated floor and seat reconfiguration system to suit the prominent events that will be held starting in the spring of 2015 and are eager to witness the seat transformation ballet at the opening of the Venue.